So far, the three friends have taken in Vladivostok, Khabarovsk, Blagoveshchensk, Chita, Ulan-Ude, Lake Baikal, Irkutsk, Krasnoyarsk, Tomsk Novosibirsk and Omsk — and that’s just the first half. From Omsk, the journey will take them to ​Tobolsk, Yekaterinburg, Perm, Kazan, Nizhny Novgorod, Samara, Saratov, Volgograd, Moscow, a few of the Golden Ring towns to its north, Novgorod and finally, St. Petersburg. Through no fault of their own, New Zealand (and even different parts of America) have a cartoonish view of cities in the United States. People tend to think of Los Angeles solely as Hollywood and made up of “fake” people. New Zealand companies – particularly those involved in technology, think of San Francisco or Silicon Valley as their default launchpad. The United States is a very large country – a market of markets – and it is very important to consider that it may be Austin, Seattle, or Los Angeles could offer the best opportunity. The reality is that Hollywood is highly visible, but makes up only a fraction of LA’s economy. The vast majority of marketing money for Los Angeles goes into tourism. The tourism dollar for the city is so valuable that it has made it difficult for the start-up community to shine. LA is the third largest tech ecosystem in the United States (behind Los Angeles and New York), but it is the fastest growing. 12% of early-stage start-ups are located in Los Angeles, and there is now a large number of companies including Snapchat ($10B), SpaceX ($5B), Beats ($3B and aquired by Apple) and Oculus ($2B and acquired by Facebook) that were built in Los Angeles. Los Angeles is the largest manufacturing centre in the United States, and a hub for aerospace, logistics, clean technology and innovation. Los Angeles port is the largest seaport in the western hemisphere. Southern California graduates the most engineers in the United States from some of the most prominent schools, including USC, UC San Diego, UC Santa Barbara, UCLA and others. Los Angeles Mayor, Eric Garcetti, describes Los Angeles as ‘the western capital of North America, the northern capital of Latin America, and the eastern capital of the Pacific Rim’. Despite all of this, there is no denying that Los Angeles is the creative capital of the United States, specialising in video content. One in seven people in LA are employed in a creative field. It is the number one metro area for art, design and media employment, and the creative industry provides more than $140B of annual economic impact to the city. Video and content start-ups are succeeding in Los Angeles. Maker is the number one producer and distributor of online video, with 6.5 billion monthly views and 450 million subscribers. DeviantArt is the leading artist social network, and Mitu Networks is the largest online Latino video network. New Zealand’s fastest growing export is IP. It grows at 10-15% each year, and has done so since the GFC. The United States is our number one intellectual property export market. Venture Capital companies in New Zealand do not have the scale of connectedness as capital that comes from the United States. It is important to think about the people behind capital – the right objective shouldn’t be to raise $5-10 million. The right objective is to find the capital provider that can help your business grow in line with its strategic objectives. The stereotype about Los Angeles traffic is largely true, but if you can base your office near the people you want to attract for work, it is very easy to have a choice about where you base yourself. There is no one tech hub. Pasadena, Silicon Beach, USC, UCLA, Santa Monica all have significant human capital, infrastructure, and co-working spaces. Los Angeles can offer a great lifestyle. LA is a city of cities – it offers a beach lifestyle, Hollywood, an urban downtown experience, hiking, and ski fields close by. Los Angeles has 300 days of sunshine every year and is offers more affordable living compared to other tech centres like San Francisco or New York City. Without forgetting that California is currently facing one of the most severe droughts on record, a water metaphor was used to describe the nuances of Los Angeles which stuck with me. “New York is a river, Los Angeles is a lake”. If you step outside in New York you will naturally go somewhere, because the city itself will take you and it is simple to navigate. In Los Angeles, to get anywhere you have to actively swim there, or you risk never getting anywhere at all. It’s a city that increasingly unfolds as you spend more time there. But that’s what makes it so exciting. 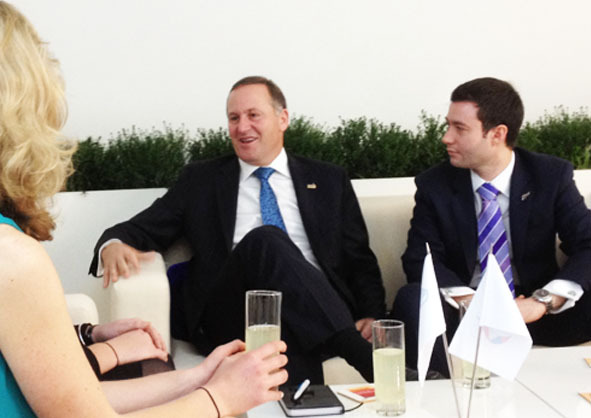 NZ INC. traveled with the Auckland business delegation to the tripartite summit in Los Angeles. Representatives from 43 Auckland businesses took part in the inaugural Tripartite Economic Alliance Summit in Los Angeles. This follows the signing in November 2014 of an alliance designed to boost economic co-operation between Auckland, Guangzhou and Los Angeles. Len Brown and councillors Bill Cashmore and Denise Krum led the delegation. Auckland Council organised it with the support of Auckland Tourism, Events and Economic Development (ATEED), NZTE and MFAT. When I arrived in London, I asked several of my London-born friends if they had visited every station on the London Underground. Once they finished laughing at me, they told me they hadn’t And that it was a ridiculous idea. Which only made me more determined to do it. The world record for passing through each station (without getting off the train) is 16.5 hours. There are near weekly attempts to beat this record, so I couldn’t help but feel an attempt at the record was futile. Besides, the stations are what interested me. I thought it would be far more interesting (and yet to be done), to get off at each platform, and get a photo taken next to the station name. This meant that I saw some fascinating things on my journey, and spotted interesting anomalies at each station. It also meant that I needed to get out at each stop, take a picture, and wait for the next train, which took a minimum of two minutes, and in some cases up to 40 minutes. In addition to this, my idea of creating a stop motion animation of my movements once the photos were placed in alphabetical order meant that I had to carry a fairly sophisticated spreadsheet with me – to tell me where I should be standing and what I needed to be wearing, holding, and doing at each station. Altogether it took about 50 hours to complete, spread over seven (non-consecutive!) days. You can view the finished video below. 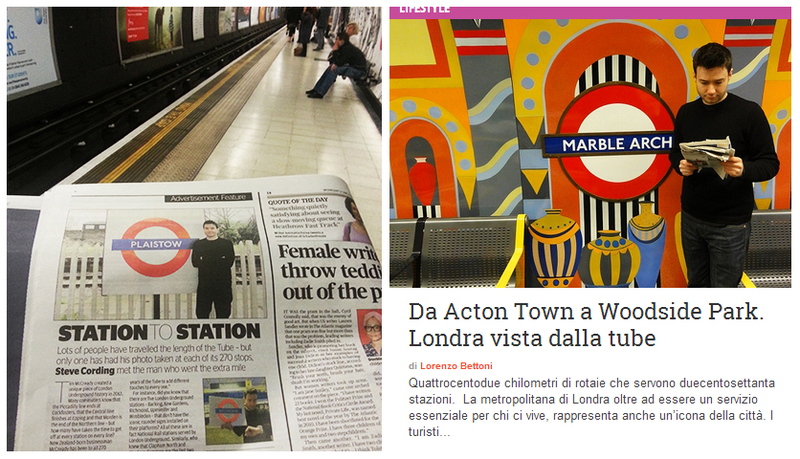 My story has been featured as part of the London Underground’s 150th anniversary celebrations on the BBC, CNN, London’s Evening Standard, The New Zealand Herald, and Italian media. Being told over the loudspeaker at Clapham Common “Can the person taking pictures on the platform turn their flash off. It is distracting to our drivers” – even though a flash was never used. Realising that the Central line trains out in the far east loop come only every 20-40 minutes. That was not fun in the winter, especially when every station required taking off my scarf, jacket and gloves for the picture. I spent a lot of time in the heated waiting rooms – until they were locked at 9pm! Six of the underground stations (Barking, Gunnersbury, Kew Gardens, Richmond, Upminster and Wimbledon) don’t have the iconic roundel signs installed on the platforms. I had to compromise somehow so I held up the sign (underneath whatever signs they did have on the platform). Greenford Station was memorable because it has the last remaining wooden escalator in the underground system after the Kings Cross station fire. 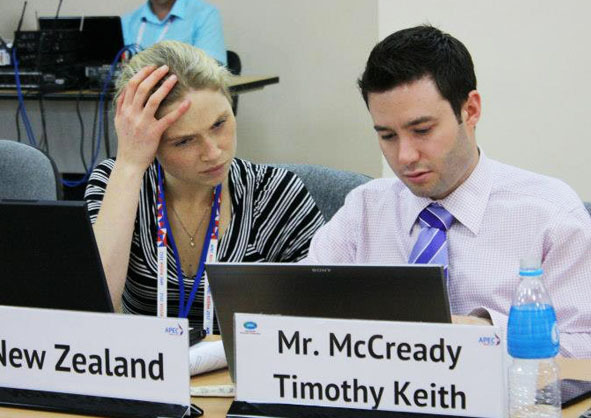 In 2012 I was asked to represent New Zealand at the APEC (Asia-Pacific Economic Cooperation) summit in Vladivostok, Russia. The summit is the Asia Pacific’s premier business event, with the Asia-Pacific’s political leaders and the regions leading CEOs in attendance. The theme this year was “addressing challenges, expanding possibilities”, and with it being held in the Russian Far East, delegates were shown an impressive country with bold ambitions – many embedded in the Asia-Pacific, that dispelled myths and stereotypes. His Excellency Mr. Hu Jintao, President of the People’s Republic of China, who spoke about the challenges and opportunities China has in their relations with Russia. He also outlined the measures and leadership China is aspiring to take on intellectual property, and inward and outward foreign direct investment throughout the APEC economies. The Honorable Hillary Rodham Clinton, Secretary of State of the United States of America, addressed the importance APEC plays with members accounting for 54% of world GDP. She spoke about the potential of the platform for economic growth, and the responsibility we have in areas such as security, and assistance for women and minorities in small business in developing countries, so they can also reap these benefits. His Excellency Mr. Vladimir Putin, President of the Russian Federation, spoke of opportunities in Russia and outlined measures being taken to ease logistics through upgrades to the Trans-Siberian railway. He fielded questions into Chinese investment in Russia and the on-going negotiations into a New Zealand – Russia/Belarus/Kazakhstan Free Trade Agreement. President Putin acknowledged that developing regions will continue to grow far more quickly than traditional markets, and that the former Soviet-era port of Vladivostok is poised to become a gateway for Russian trade and investment with Asia. Russia has finally joined the World Trade Organisation after an 18 year wait, and having Vladivostok chosen as the APEC venue marked an exciting time as Russia becomes more integrated into the global economy. I formed part of the Small and Medium Enterprises working group at APEC, and was elected by my working group to present the declaration back to the wider APEC community – which included Russian media and APEC officials. recent calls for the strengthening of the Waitangi Tribunal, and where the government thinks the Treaty of Waitangi stands in New Zealand’s future. the Prime Ministers upcoming meeting with Russian Federation President Vladimir Putin, and the status of the New Zealand – Russia free trade agreement. Food: Feeding seven billion people. Speakers including Sergey Polyakov (General Director of United Grain company) and Samuel Allen (Chairman, John Deere & Co), who discussed the challenges we have with a growing global population and depleting resources. Health is wealth. Panelists included the CFO of Johnson & Johnson, the Chief Research and Strategy Officer of Microsoft, as well as New Zealander Ian McCrae (CEO, Orion Health). The changing landscape of healthcare was discussed, and it was noted that we have reached a time where medical knowledge has surpassed what healthcare practitioners can know, which creates a discontinuity in how medicine is practised around the world. One of the most inspiring moments was when the panel discussed how investment in health can provide a significant social and economic return to economies. The panel agreed that people should be thought of as an investment, not as a cost – because without people, you won’t have a company. The theme of APEC this year was “addressing challenges, expanding possibilities”, and the summit did a great job of covering these topics. On a more personal level, having the opportunity to attend APEC as a Voices of the Future delegate has encouraged me to reflect on my own challenges and possibilities within the Asia-Pacific region. 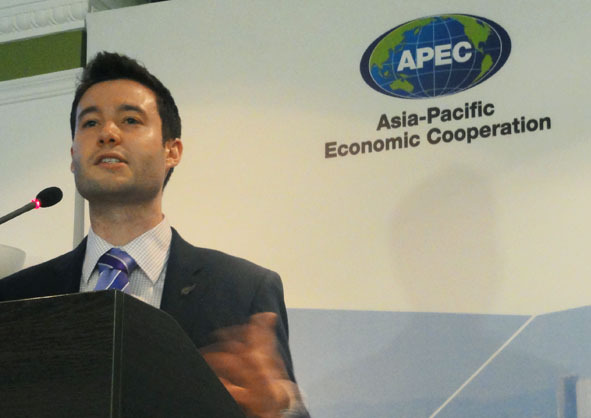 I have previously done business with major Asian markets, but my eyes have truly been opened to the opportunities within emerging APEC economies. 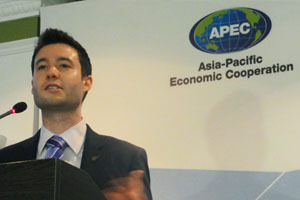 Business and political leaders from those regions are excited about their potential – and they have good reason to be. That excitement has been infectious, and the experience and insights I have left Russia with will stay with me always. 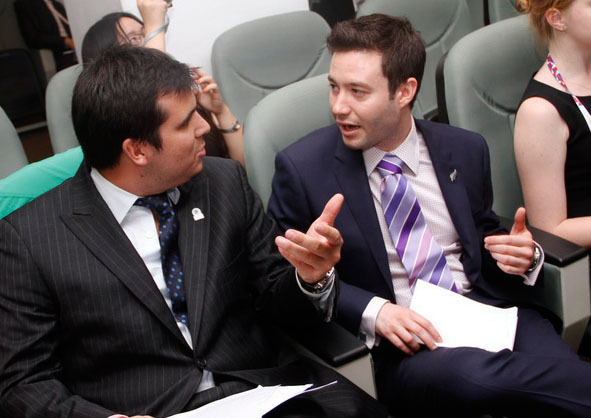 In 2010 I was invited by the Japanese government to visit Tokyo and Hokkaido in an initiative to foster closer connections between New Zealand food producers and businesses. This visit has resulted in continued collaboration between New Zealand and Japan, and taught me a great deal about Japanese business and culture. Below is an email I sent to colleagues mid-way through my visit to Japan to share what I had learnt. Sent: Sunday, 11 July 2010 6:21 p.m.
I’ve been slow to write an email to everyone since I arrived in Japan – the Japanese government have done a fantastic job of packing our schedules full of interesting meetings, and I haven’t had a chance until now. Every day we’ve started at around 6, and not back to the hotel until after midnight! Loads of fun though. I’m really loving wandering the main streets with modern skyscrapers, and then turning into an alleyway and seeing the traditional buildings tightly packed together and hidden underground restaurants. A real eclectic mix. I flew into Sapporo (in Hokkaido, the top part of Japan) today and will be having an early night because we’re going to the fish markets tomorrow at 5am to watch the wholesale tuna bidding. Tokyo has been ridiculously hot and humid, so it’s nice to be in a city now that is still quite warm, but with no humidity at all. There was even a cool breeze tonight, which makes for a nice change! I visited Asakusa (one of the oldest parts of Japan, and one of the only places packed with souvenir stores) to see one of Japans oldest temples. What our guides didn’t realize was that the day we went (July 10) was the day of 46,000 blessings. Worshiping on that day is apparently equivalent to performing acts of merit for 46,000 days. We weren’t told this until after we left, so, unfortunately, I missed out on 46,000 days worth of merit. I did manage to pick up a few souvenirs but I don’t think I’ve ever seen a crowd like that before. Part of my programme here allowed me to participate in a formal Japanese tea ceremony. This was particularly interesting because we learnt the rules of the tea ceremony, the kimono they wear during the ceremony, and the art of Japanese flower arranging. It was amazing to see the tradition that is still followed, and how important that still is to people. We visited an organic farmers market about two hours out of Tokyo. This is an initiative they’ve been using to introduce farming and agriculture to the people of Japan, where people can buy a small allocation of land, and come out from the city a couple of times a month to care for it. 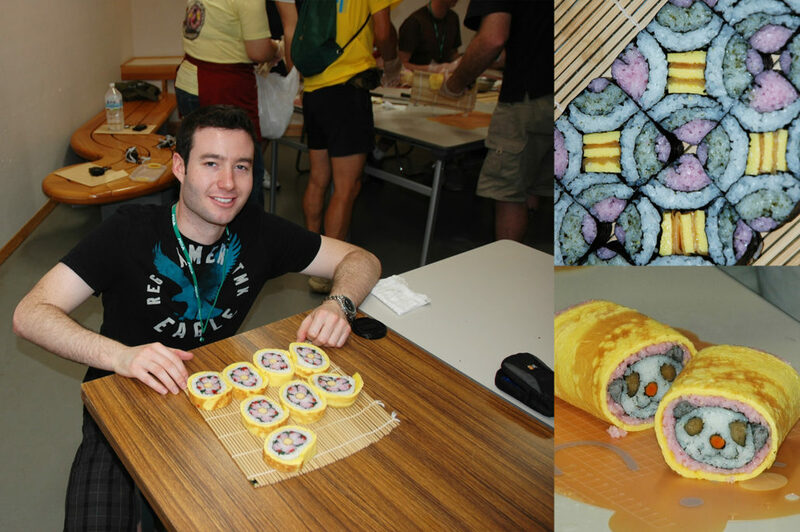 While there we got lessons on making some of the fanciest sushi I’ve ever seen in my life (which included sushi shaped into pandas, snails, and flowers). It was ridiculously fiddly and not something you’d be too keen on if you were in a hurry for a meal. 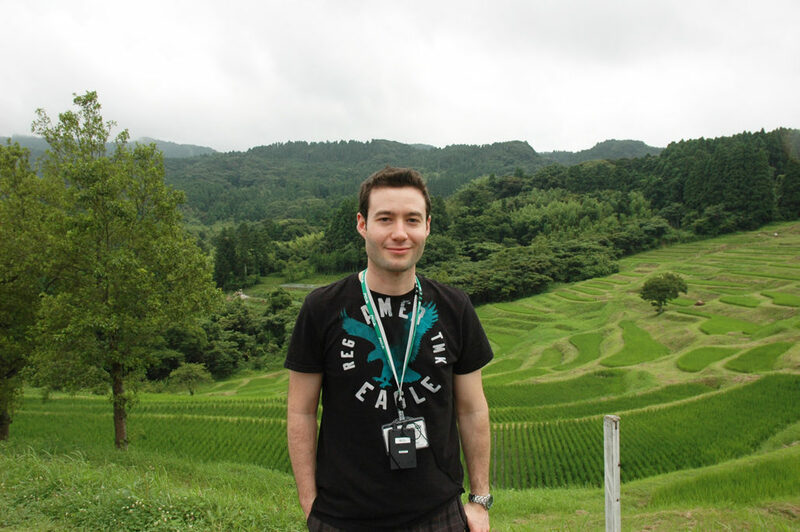 We carried on and visited one of Japans oldest terraced paddy fields. It was interesting to see them up close – the ecosystem at the base of the plant is really interesting (with frogs and tadpoles living in the water). The plants are grown on a bed of clay that has a base of water on top, which is slowly drained down to each paddy field. It was interesting to hear that the farmers with the paddy fields at the top of the hill have the best quality rice because the water is cleanest – but everyone pools their rice together so that the quality remains consistent and there is no difference in the money farmers get for their rice. On the same day, we visited Japan’s top (2010 gold medal winning) sake brewery in Minnami-no-sato. They also grew their own rice out the back to produce their sake. I never knew you could have so many different varieties of sake – the owner had testing stations (similar to a vineyard), but with over 30 varieties. Some of the sake tasted extremely mild, but some (particularly the 1998 vintage) tasted suspiciously diesel-esque. One of the people in our tour had a bottle of 42 below vodka they had picked up from duty-free on their way to Tokyo, and traded it with the brewery owner for a bottle of sake. The owner picked out his most expensive bottle (over NZ$200 worth) for the exchange – so it worked out a pretty good deal for the kiwis! 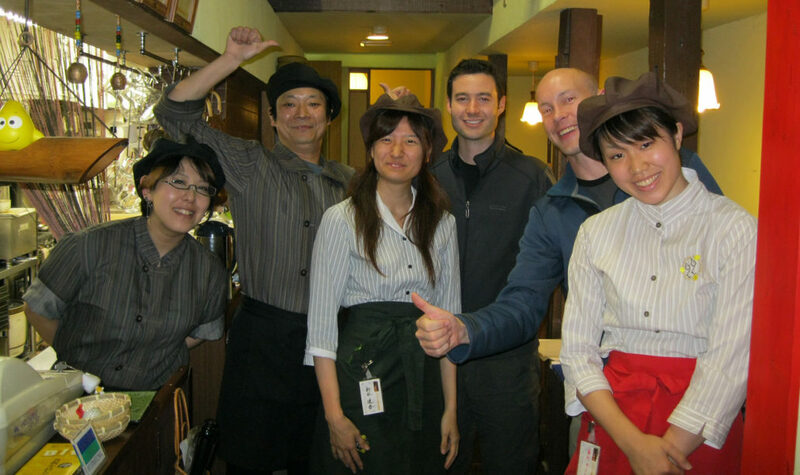 The Japanese government is definitely taking good care of us, and taking us to some pretty impressive restaurants. Yesterday we went to a place where sumo wrestlers fight, and had a traditional sumo wrestler (protein rich) Japanese meal. It consisted of your traditional bento box, as well as an enormous bowl of soup cooking on the table that was full of seafood, chicken, plenty of chicken skin, fish, shiitake mushrooms and (one or two) vegetables! One of the most interesting things I’ve seen here is the fruit and vegetable section at supermarkets. We’ve heard constantly at the talks we’ve been to that Japanese like their food to be safe, healthy, packaged nicely, perfect and consistent – and it’s true. I’ve never seen fruit of the same standard back in New Zealand. People buy individually boxed apples that have absolutely no blemishes on them. The rockmelons are perfectly spherical with the stems left on, which are then trimmed to look exactly the same as all the others. 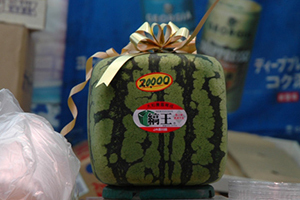 They have square watermelons here, which are grown inside a container to create the cube shape. The only benefit I can see from this is that it makes them easier to stack in the shop, and they can be wrapped with ribbons and bows to resemble a present. I don’t think this justifies the price – 20,000 yen (about $330 kiwi dollars! ), but people seem prepared to pay for it! I was wondering what they did with fruit that wasn’t perfect. When I asked in meetings I was told that most of it would never be sold – but I did stumble across a seconds bin at one of the supermarkets. They had a bunch of bananas in it – one of the bananas had a single blemish on it – they were far nicer than any bananas I’ve ever seen anywhere else in the world – and they were reduced to clear for $1.50 for the bunch. (No one else in the supermarket seemed interested in buying them so we picked them up and shared them around the delegation!). Most Japanese produce and meat have little barcodes on them that customers can scan in the store with their mobile phone, and they can instantly see a photo of the farmer, facts about the farm, and how long the farmer has been in business (it comes down to the importance of the safety of food supply again). 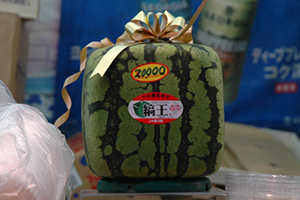 We were told that foods labelled as Organic don’t necessarily sell very well in Japan. All Japanese food is of such high quality that consumers assume all products meet that quality, which means there is little differentiation between standard and organic products. We have had some great meetings with the Ministry of Foreign Affairs and the Ministry of Agriculture, Forestry and Fisheries. The Minster talked to us about a potential Free Trade Agreement with New Zealand, but explained that Japanese farmers are worried that an FTA could threaten their already tight profits. They also feel like New Zealand played its hand when we reduced the tariffs on their car imports into New Zealand, so we have a lot more to gain on an FTA than the Japanese do. The meeting with the Ministry of Agriculture made it clear that Japan is extremely worried about global warming and greenhouse gas emissions. They are doing a lot to reduce or offset carbon emissions and believe that they are already seeing the effects of global warming on their fruit quality. The government is also worried about the safety and security of their food supply. Japan produces only 40% of their required food source, and imports the rest from around the world. They are trying really hard to push this up to at least 50%. Japan does, however, produce almost 100% of its required rice – there are rice paddy fields in every spare piece of land you can imagine. The profits in rice production are ridiculously small, and even though it is a staple of their diet, Japanese people are becoming more westernised and starting to eat alternatives for breakfast. As a result of this, the government is running a huge marketing promotion right now to promote eating rice – they’re even rolling out a lot of new rice products (including rice ice cream and rice pizza) to encourage people to eat it. Some farmers are converting from rice growing to livestock – but because rice paddy fields are mostly located in marginal land this can’t always happen. The rice farmer told us that the farmers in this position can’t even sell their land – no one would want it. The other big issue facing Japan (as well as the rest of the world) is an ageing population. The population of Japan is ~120 million, but they expect this to almost halve over the next twenty years. Unfortunately, most of their farmers are older people too, because the younger generation isn’t interested in farming and move toward the cities. The Japanese government provide income support to encourage younger farmers into the industry and entice farmers to increase their competitiveness with innovation. On our visit to the National Institute of Fruit Tree Science (their equivalent of Plant & Food Research in NZ) in Tsukaba city, we got to try a new peach variety that is in development. It was really delicious. Although not as juicy as peaches back at home, it as much sweeter and had more flavor. We also saw some pretty interesting technologies they are experimenting with in the orchid to for nashi pear and apple growing too – they are working hard to produce trees with lower hanging fruit – so that the older generation can continue working and picking fruit well into their 80’s. Most farms in Japan are run as family farms, and not as an efficient business. We had a 25-year-old farmer from Tokyo come and speak to us at a function in the New Zealand embassy. It was interesting hearing his perspective – he only has 40 cows (on three hectares) and had his whole family of five working full time on the farm. He had spent a bit of time on New Zealand farms with over 1000 cows trying to learn how to improve things. His take on it was that Japan could never compete with New Zealand’s efficient agriculture, so his plans are to add value to his milk by turning it into gelato and setting up a shop near his farm to sell it. A lettuce grower we visited explained that his farm runs at a loss. He works six months of the year away from the family farm in order to provide the money required to run it. 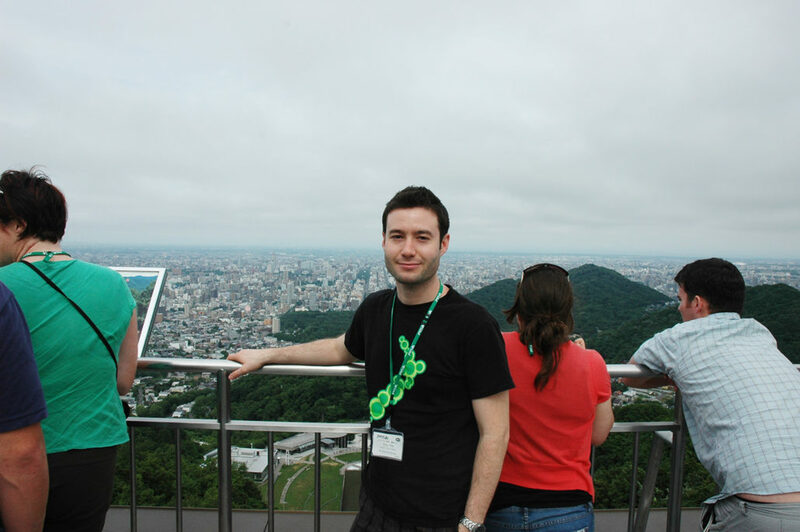 There are 1.28 million more men in Japan than women. Additionally, marriage is happening increasingly later in life, and is even becoming unpopular for women (who often see having kids and a career as mutually exclusive). By 2020 it’s expected that 36% of men in Japan will be single. This means that there are a lot of things sold in supermarkets for individuals (a box with a single apple in it, tiny packages of condiments etc). One of our speakers told us how Japanese people love new innovative ideas – even if it’s not something life changing but just slightly different. As an example, the supermarkets here roll out a new type of Kit-Kat almost every month and then get rid of it just as quickly. I have seen a yoghurt and aloe vera Kit-Kat, a corn Kit-Kat, and a cantaloupe Kit-Kat – and they sell ridiculously well. Coke seems to be doing the same kind of thing – the coke bottles here at the moment are all shaped like soccer balls (which are challenging to hold) because of the football world cup – and sales have spiked! Today on our way to the hotel from Sapporo airport, we went past the sites of the 1972 Winter Olympics. We stopped at the ski jump track where we took the gondola to the top and got an amazing view of the city. I also got to stand on the podium and pretend to be an Olympic gold medal winner which is definitely the only time that will happen! So far Sapporo seems like a really nice city. Because it’s the middle of summer here right now, and Sapporo is the home of Sapporo beer, there are beer gardens and markets set up all over the place. While we’re here we’re visiting a horticulture farmer, a milk production company, the Sapporo brewery, as well as Otaru City (Dunedin’s sister city) to meet with the Otaru Municipal Government.